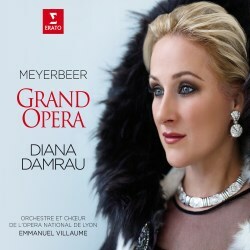 Soprano Diana Damrau has recorded a collection of arias from ten Giacomo Meyerbeer operas. On a personal note, as an admirer of the Berlin-born composer: this is one of the most welcome recital releases for some years. Certainly I did not think I would ever see an album devoted entirely to Meyerbeer arias, performed by one of the pre-eminent opera singers on the world stage. I notice that two of the arias are described as world première recordings. Meyerbeer was one of the most famous and successful opera composers of all time. Then this music of fell from grace and has languished in relative obscurity for decade after decade. Rarely performed today, the composer’s four exceptional French Grand Operas Robert le diable, Les Huguenots, Le prophète and L'Africaine dominated the international repertory for nearly a century. Meyerbeer has been a passion of mine since I heard recordings of a number of his opera arias in collections from the 1970/1980s sung by such renowned performers as June Anderson, Joan Sutherland, Placido Domingo and Luciano Pavarotti. Whilst in Berlin a few years ago, I visited Meyerbeer’s grave in the Jewish Cemetery, Schönhauser Allee in the Pankow district. The Meyerbeer family memorials are large and impressive, although the desecration of the Berlin cemetery by Nazis, who smashed up the graves stones with sledge hammers, is still very evident. From time to time a revival of one of Meyerbeer’s operas is given, such as Laurent Pelly’s Covent Garden 2012 staging of Robert le diable, and inevitably sparks a modicum of interest which soon seems to wane. The Bavarian-born Damrau first came across Meyerbeer’s music with the coloratura aria Ombre légère from Dinorah. She was then as a student in Würzburg singing her scenic cantata Gli Amori di Teolinda for soprano, clarinet, chorus and orchestra. For a time she absorbed herself in his music, developing a passion that still holds firm today. In the booklet notes, Damrau highlights Meyerbeer’s ability to enter into the spirit of different national styles when he composes in Italian, German and French. The collection here ranges from the 1814 singspiel Alimelek, oder Die beiden Kalifen well before his Paris successes which started in 1825, to his final grand opera L'Africaine written for Paris in 1865 and premièred posthumously. A remarkable communicator, Damrau is one of the finest sopranos around today. I admire the way she combines a rare artistry with an abundance of enthusiasm. I recently enjoyed her performance as Priestess Léïla in Penny Woolcock’s 2016 production of Bizet’s Les pêcheurs de perles from New York Met on Erato DVD/Blu-ray. Here the Bavarian soprano exhibits a range of excellence from a truly caressing pianissimo to her most dramatic outpouring of emotion. Damrau is assured in the coloratura passages, with an attractive, well-focused tone. Every aria has merit in this consistently enjoyable collection, but there are several performances that stand out. A cherishable highlight is Isabelle’s showstopping aria Robert, toi que j’aime from Robert le Diable, a tender and lyrical romance with the soprano accompanied by cor anglais and harp. Thoughts that it might be hard to erase from my mind June Anderson’s stunning 1989 Toulouse account on EMI were unwarranted. This is mightily assured and expressive singing from Damrau, displaying gloriously smooth glides to her high register. From the German language opera Ein Feldlager in Schlesien the aria Oh Schwester, find’ ich dich!... Lebe wohl, geliebte Schwester feels inspiring. It communicates Therese’s crushing sadness and pain as her lover is to be executed. Inès, the fiancée of Vasco da Gama, has a pair of arias in L'Africaine and Damrau is in meltingly passionate voice. With Là-bas, sous l’arbre noir... Fleurs nouvelles impressive is the slide to her high register, and in Anna, qu’entends-je...“Adieu, mon doux rivage the coloratura element is rendered so attractively. Another stunning highlight is Queen Marguerite de Valois’ grande scena, Ô beau pays de la Touraine… A ce mot seul s'anime from Les Huguenots, sung by Damrau with unerring virtuosity and alluring charm. Conductor Emmanuel Villaume conducts scrupulously prepared readings of the arias, and the skilful and committed performance of Orchestre de l’Opéra de Lyon feels like a labour of love. The recital was recorded at Opéra National de Lyon. The engineering team has provided good quality sound, withclarity and a satisfying balance between soloist, chorus and orchestra. My copy of the album is described as a Limited Edition Casebound Deluxe, which, as the title suggests, is a tough hard-back booklet. Well presented, it contains several interesting drawings of sets, costumes and performers from original Meyerbeer productions. Gratifyingly, sung texts are provided in the booklet with English translations, together with a helpful essay by Alexandre Dratwicki titled Strange Flowers, Strange Trees - Meyerbeer and innovations in French grand opera.There also is a wholehearted personal note from Damrau. On this Erato collection Diana Damrau is in remarkable form, and it is hard to imagine Meyerbeer’s cause receiving greater advocacy.